With few exceptions – the most notable being a vehicle braking system – friction is not a good thing. In engines, it accelerates wear of internal components, saps power and burns extra fuel. In a supply chain, friction reduces efficiency, wastes capital, limits customer choice and ultimately leads to higher prices. Not surprisingly, dating back to the dawns of both the internal combustion engine and modern supply chain, businesses have spent billions of dollars on technologies designed to reduce friction. And the ultimate tool in this battle – whether in an engine powering a Class 8 tractor or in the choreographed movement of raw materials and finished goods – is the availability of the right information at the right time. Just as sensor data flowing into an engine’s powertrain ECU enables cylinder deactivation and other friction- and fuel-saving technologies, real-time visibility at the freight level can advance supply chain partners’ efforts to react more quickly to changing market conditions, accelerate product introductions, reduce inventory requirements, improve service levels and better match freight to available shipping capacity. 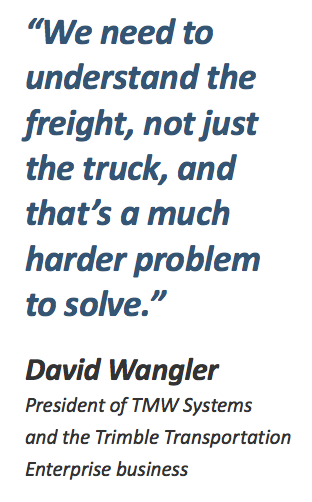 Over the long term, it could transform the freight transportation industry from a comparatively inefficient, inflexible behemoth to a far more market- and customer-focused eco-system that continuously adapts to data-driven intelligence. This potential is hardly a secret. Gartner identified visibility as the “No. 1 supply chain initiative” based on results from its 2016 User Wants and Needs Survey, and visibility was ranked as shippers’ third-most requested IT-based capability in the 2018 Third Party Logistics Study from the Center for Supply Chain Research at Pennsylvania State University. Demand for end-to-end visibility is being driven by many factors, the most obvious being the rise of online-only and omni-channel commerce, which are causing shippers to rethink traditional inventory positions and transportation networks. But it also reflects the monumental influence of mobile communications technologies within the consumer market, which can tell us when our table is ready at a crowded restaurant or when a certain check has cleared our bank account. From a distance, it just doesn’t seem like rocket science. Heniff now has the latter capability through its recently implemented enterprise freight visibility solution from 10-4 Systems. 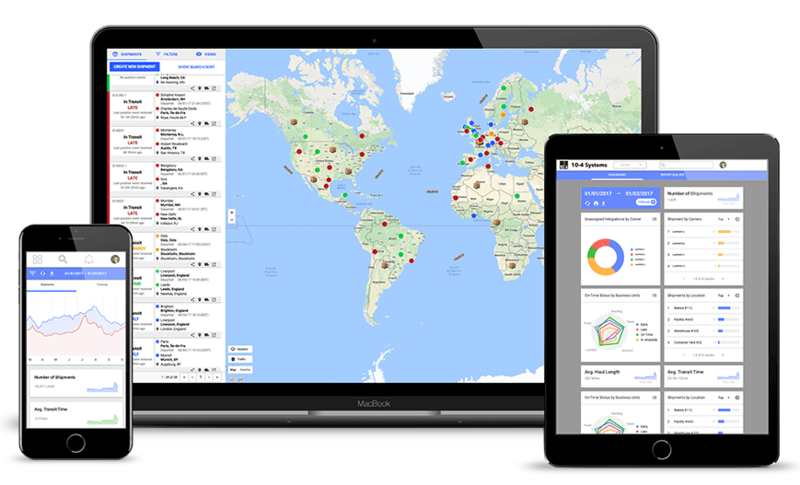 The 10-4 solution, integrated with the hauler’s TMW.Suite transportation management platform, offers real-time order status information to shippers and carrier staff through a custom-built freight portal and mobile alerts. 10-4 Systems was acquired by Trimble in September and is now part of the Trimble Transportation Enterprise segment, along with TMW and ALK Technologies. “We initially looked at (the 10-4 solution) as a tool that would primarily benefit our customers, but as we completed our beta testing we realized our own staff would benefit as well,” Neal explains. Heniff is now using the solution to help its driver managers better monitor the entire order lifecycle, giving them a deeper view not only into load status but also the real-time operating environment facing the driver. “Is that driver on time? Is he satisfied? What can we do to proactively reach out and coach him? We can answer all these questions now,” Neal explains. Heniff plans to integrate this information into its driver manager scorecards, as well. While freight portals have been around for more than 20 years, these largely EDI-driven solutions have limited utility in an increasingly multi-modal transportation environment. As a load might progress from ship to dray to rail to cross-dock, the cascading loss of real-time visibility eliminates much-needed insight into supply chain performance. Shippers increasingly want and need to understand the complete transportation lifecycle. 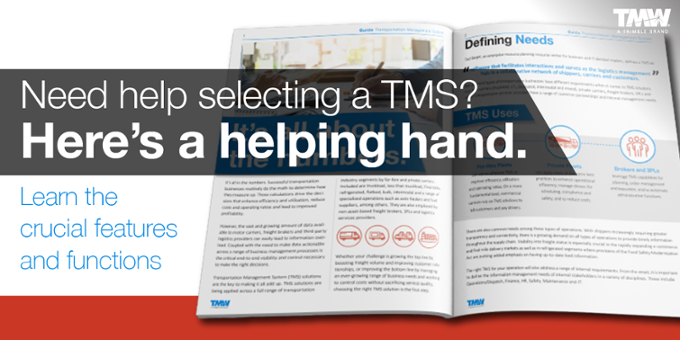 It’s a harder problem because of the multitude of providers – 3PLs, carriers and brokers, as well as ERP, WMS and TMS platforms – represented in a shipper’s supply chain. This IT fragmentation can now be resolved by leveraging web services, APIs and mobile communications technologies in coordination with leading TMS providers. This approach is already providing SKU-level visibility to shippers and distributors in the food and beverage markets – with their inherent product safety concerns – and is expected to become the norm across all types of freight. “Uber and Amazon set the bar high for visibility on B2C transactions. We’ve taken the same approach at the B2B level and modeled it so that retailers, commercial packaging groups, food and beverage companies and, now, carriers and 3PLs, can leverage this capability,” explains 10-4 Systems Executive Vice President and General Manager Travis Rhyan. Key to this capability in commercial trucking is what Rhyan describes as “highly intimate” integrations with carrier TMS platforms, resulting in a holistic flow of information. This level of integration has already enabled 10-4 users to provide real-time visibility extending to in-home, white-glove delivery service. In a way, this model mirrors a transportation network, but with the focus on moving information rather than freight. This capability answers the shipper’s need to improve customer services and work in partnership with its supply chain partners to manage exceptions and target cost savings. But the next step – what some consider the “holy grail” – is to leverage real-time visibility to improve utilization of shipping capacity and, by extension, reduce friction within the supply chain. This process will likely accelerate the move away from transactional supply chain relationships to those based on mutual responsibility and value. As one example, shippers would be motivated to troubleshoot inefficiencies at the plant and DC levels because they will have ample evidence of detention issues and other ways in which they complicate the lives of their 3PL, broker and carrier partners. Another concern is the reluctance of smaller carriers, particularly owner-operators, to integrate with a modern visibility solution. “We still face a hesitancy on the part of smaller carriers to even provide a cell phone number so we can track a driver or a load by phone,” says Anna Hummel, director of brokerage solutions for A. Duie Pyle. Hummel points to two leading reasons: concern on the part of the dispatcher or driver about their ability to deliver on time, or resentment of the perceived intrusion into the carrier’s operation. “In some cases, we have an excellent driver who is never late, yet he simply doesn’t want us calling his cell phone,” she says. Given that carriers operating fewer than 20 power units make up nearly one-fifth of North American freight capacity, answering these concerns will be critical to the success of any visibility solution. TMW’s Wangler articulates that answer in one word: leverage. During the fuel crisis of the early 1970s, US consumers were clamoring for ways to reduce fuel consumption. Engineers at Chrysler Corporation came up with an engine “visibility” solution called “Fuel Pacer,” which triggered driver-facing warning lamps mounted on a vehicle’s hood. Therefore, whenever the driver of a mid-70s Chrysler Cordoba (remember “Corinthian leather?”) was wasting fuel through inefficient acceleration, the amber lamps turned on. Problem was, they almost never turned off. Visibility has come a long way in engine technology…and in the supply chain. True, that “Fuel Pacer” technology would likely indicate that today’s supply chain is never truly efficient. But each succeeding generation of technology is bringing us closer to the highly adaptive, market- and customer-focused eco-system the experts describe. We can almost see the progress in real time. For more information on real-time visibility for your transportation services business, contact us.